Fiber is a type of carbohydrate for which we do not make enzymes needed to break down the chains of sugars. Instead, the bugs in our gut break down some types of fiber, such as inulin and FOS (other types are flushed out with our stool). Inulin and FOS are made up of chains of fructose (fructose-saccharides); inulin has longer chains of varying length, while FOS have shorter chains of known length, and are often synthetic. For a printable (pdf) version of this article, see “inulin & carbs.pdf” (title is Inulin: Non-Starchy Carbohydrate (Fiber)). (need to update file Inulin & carbs.pdf / pages; saved in HEALTH-NUTRITION>DIET). I opened the pages file and saved as inulin-carbs-2019.pdf so I can update. 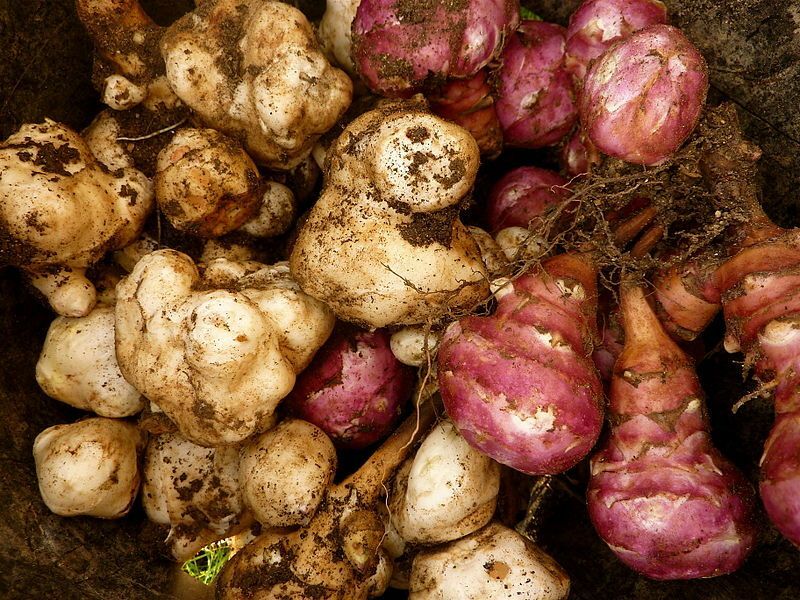 A story, written in 2008: I was adding Jerusalem Artichoke to my root veggies article, when the proverbial light bulb lit up. I’ve been making a smoothie every morning for over 10 years, and a few months ago, I started adding fructo-oligo-saccharide (FOS) crystals to my morning smoothie at my doctor’s suggestion, to support growth of beneficial probiotics colonies in my gut, and to help control my insulin resistance. I prefer not to get my foods from refined sources, but did not know how to add FOS as whole foods. “A-Ha! 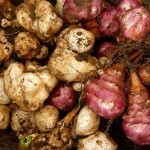 I could use the humble Jerusalem artichoke in my smoothie! Or Dandelion.” Or less-refined supplemental inulin. some fruits such as bananas. Generally, foods that store energy as fructans (fiber), do not store energy as glucans (starch). Another common type of fructans are agavins (from the agave family) (10). Humans lack the enzymes to digest and absorb fructans, so they fall into the larger class of carbohydrates known as “fiber.” Inulins would pass through our digestive tract and out in our stool intact, were it not for the good bacteria (probiotics) in our large intestine, who, rather than breaking them down into simple sugars, ferment them into non-sugar products we can absorb, as well as a bit of gas (carbon dioxide, hydrogen, and/or methane). If you are not used to eating inulin-rich foods, go easy at first. Digestion of all fructans happens by the effort of certain probiotic bacteria in our gut, primarily the bifidobacteria, which makes inulin a prebiotic (means “foods for probiotics”). The good bugs in your gut break down fructans by fermentation to short-chain fatty acids (SCFA) such as butyric acid (or butyrate). By consuming fructans, you help increase the population of bifidobacteria (an important good bug) in the colon. For purposes of my discussion, I will refer to both Inulin and FOS (fructo-oligo-saccharides) as “Inulin,” unless I wish to make a distinction. The shorter-chain FOS molecules are 30 – 50% as sweet as table sugar. The longer chain inulin, is not particularly sweet, but has a pleasant feel in the mouth which can be described as “sweet” or “creamy.” For this reason, different forms of inulin are being used increasingly as food additives in processed foods to mimic the missing sugars in low-carb foods, or the missing fats in low-fat foods (2A). butyric acid (as in butter), a 4-carbon chain. Commercial and supplemental inulin/FOS is a highly refined, crystalline substance. But these fructans can be found in certain foods (a much better source than supplements), most particularly roots and rhizomes, such as jerusalem artichoke, chicory, dandelion, and garlic. food sensitivities or other intolerance symptoms. However, as mentioned earlier, start slowly and watch for signs of gut flora imbalance. You may need to deal with that issue before you can restarting inulin sources. Also remember that food sources will be more gentle than supplemental sources. See also “Who should avoid inulin,” below. Globe artichokes (the kind we are used to eating) also produce inulin in their roots, but they are unrelated to jerusalem artichokes (globes are a thistle, Jerusalems are a sunflower). They stimulate liver activity by promoting circulation within the liver, protecting glutathione, and assisting in formation of bile acids. Jarrow Formulas offers globe artichoke extract in capsules that can be taken as a supplement (see iHerb, product ID JRW-14062). However, I still recommend food sources, and remember to start slowly and watch for signs of gut flora imbalance. See also “Who should avoid inulin,” below. FODMAPS, including FOS and disaccharides, are short-chain carbohydrates that are difficult for some people to digest. Instead, they’re fermented by your gut bacteria, causing gas, pain, bloating and diarrhea. FODMAPs are found in many foods and include lactose in some dairy, fructose, galactans (found in some legumes), polyols (found in sweeteners like xylitol, sorbitol, maltitol and mannitol) and fructan (i.e. inulin). raysahelian.com/inulin.html: Am J Clin Nutr. 2003 Mar;77(3):559-64; J Biosci. 2002 Dec;27(7):703-14; Br J Nutr. 1999 Jul;82(1):23-30. This entry was posted in Health and tagged fiber, FODMAP, FOS, inulin. Bookmark the permalink.